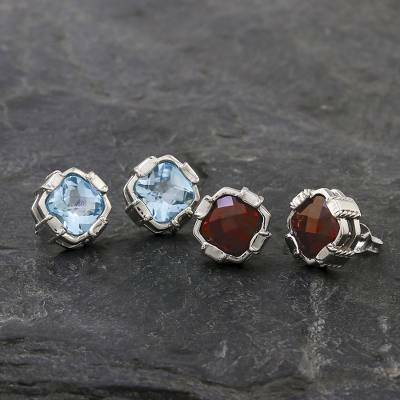 You can find blue topaz button earrings 'Everyday Glitz' by Michael Krainer in jewelry categories such as Gemstone Earrings, Birthstone Earrings, Nat Geo Gifts Earrings, Blue Topaz Earrings, Silver Earrings, Sterling Silver Earrings, Rhodium Plated Earrings, Button Earrings and Stud Earrings. Enjoy exploring these sections for other Novica treasures. I wanted this to match a ring and necklace i had. All 3 are different depths of color, but i think I'm the only one who will know... also, i am elderly, and the weight of the earring makes it hang a little funny. I look forward to wearing them. Great quality!